As soon as I did the hula and got off Orientation Island, I searched for Luskwood, TP’d there, and stayed for three years… became Premium, joined the land group, and picked up two adjoining 512’s in Tehama. Yes, I was seduced (heh heh) to the human form for a while, and financial circumstances forced me to give up the Premium and the land two years ago… but in my heart, I’m still a Luskwood fur. I wear one now =^.^= and have three others in my inventory. They celebrated their 9th birthday this past weekend. 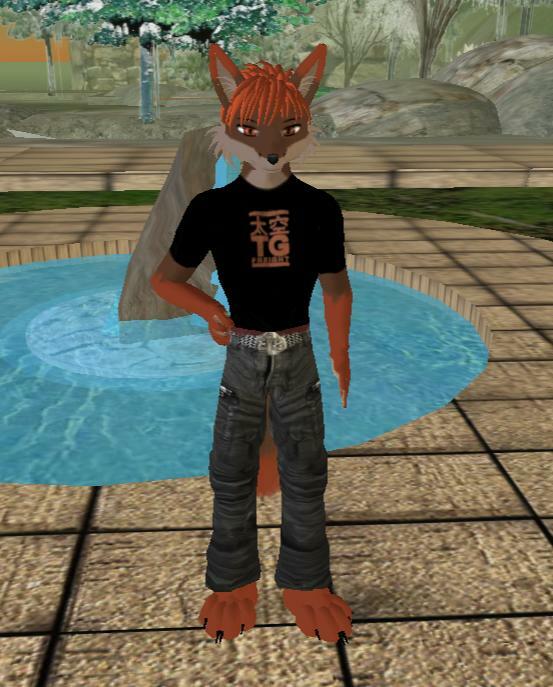 In spite of what was once near-perpetual griefing and other harassment, they’ve survived as not only the oldest continuous furry community, but the oldest continuous community of any kind in SL. 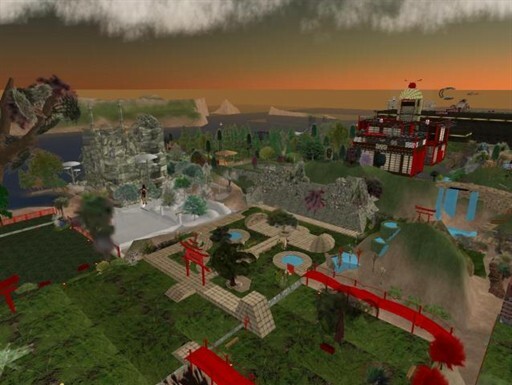 We come, finally, to the last of the First 20 — those regions which were created before Second Life went from closed to open beta. I saved it for last of this group because, since May 2008, Tehama has been my home. By a quirk of fate, and the existence of the basement museum at the Governor’s Mansion, Tehama also has something most other regions lack: a record, however slim, of its earliest days on the Grid. 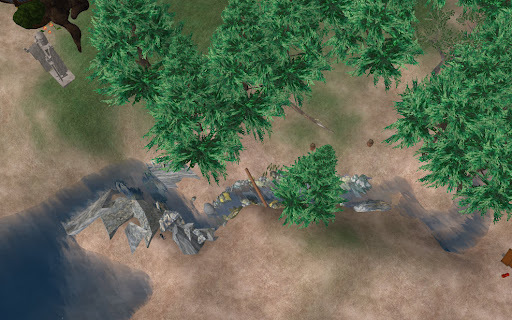 On the map of April 1, 2003 (which will be seen with the next group of sims to be revealed in this blog), there is a red pushpin icon stuck into the northeast quarter of Tehama and labeled “Lindenberg”. This is one of three screenshots of Lindenberg in that museum; all of them are labeled “February 03”, but carry no other information (such as, who took them). Since beginning the writing of this entry a couple of days ago, I have become immersed in (obsessed with?) trying to determine where my home parcel might fit into the time-deep map of Tehama. Clue #1: At the left edge of that Lindenberg photo, you can just make out a sort of stepped sidewalk. It’s still there. 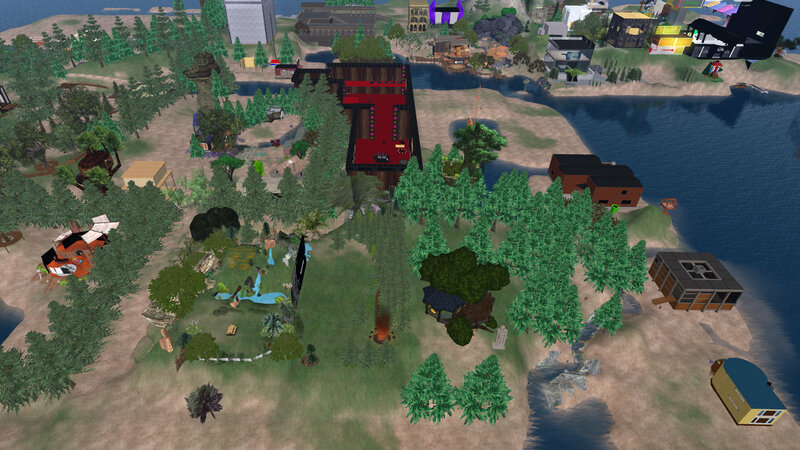 And, it’s been “Governor Linden land” since the region first rezzed on the Grid. The stretch of sidewalk in question is not easy to see in the above shot (taken on the midnight setting to emphasize the property lines, with east at the top)… it’s the one running horizontally just beneath the About Land floater. From this I deduce that the Lindenberg photo was taken from above Tehama’s eastern border with Freelon, looking west, and that the cabin appearing beyond the sidewalk sits on what now is my neighbor’s parcel. Clue #2: After the demolition of Lindenberg (date unknown), most of Tehama was bought up by Snakekiss Noir, who built an extensive Japanese-themed park with an open-air market and her store, NeoJapan, at its western edge. The sidewalk runs diagonally toward the lower right corner, emerging from behind the treehouse (which is about where the hill with the torii on top was in 2005). 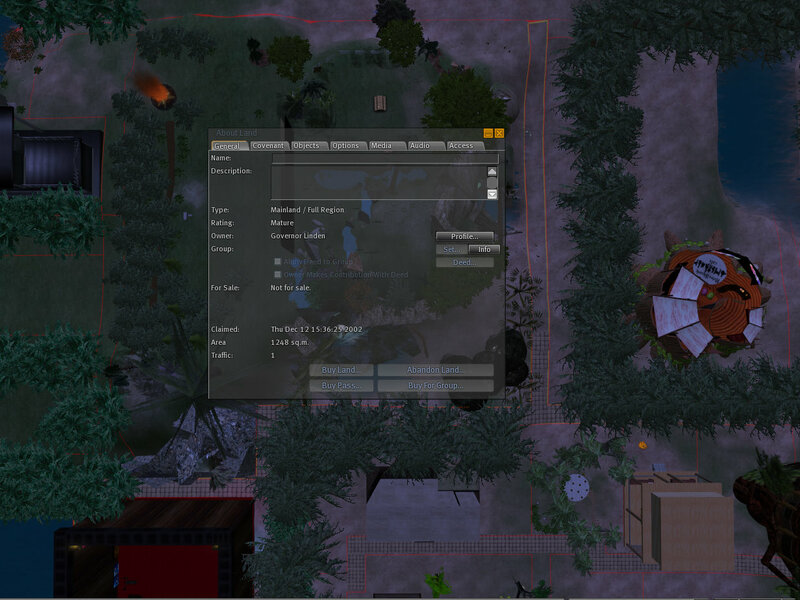 Conclusion: My home (the small brown cabin in the center of the above photo) sits where the southern (left) circular pond was in Snakekiss Noir’s Tehama. That carries even deeper significance than merely confirming the approximate coordinates. When I was a homeless nooblet (December 2007, until I took a rental in March 2008), I chose that park as a quiet spot to rez in. It was convenient to Luskwood, where I spent all of my hang-out time. That’s one of the oldest photos I’ve ever taken — when I was still less than two months “old” — standing on the very spot where, in another three months’ time, my front yard would be. We all know how long three months can be, compared to the way things change in Second Life. 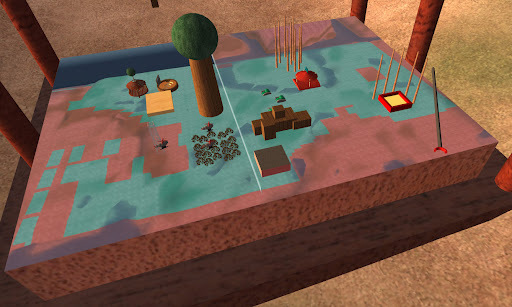 Some time in the spring of 2008, while I was renting a tiny box of a place in the pueblo above Red Rock, Snakekiss Noir pulled up all of her builds and abandoned the land. 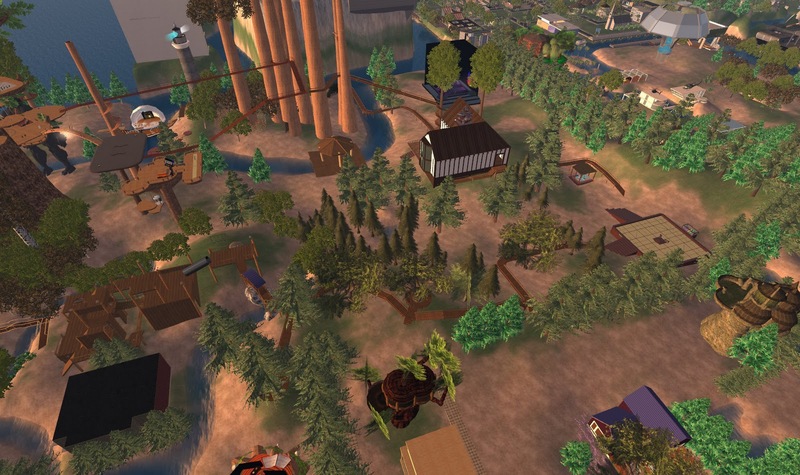 In the aftermath, the Luskwood Residents group snapped up a fair-sized piece of Tehama. 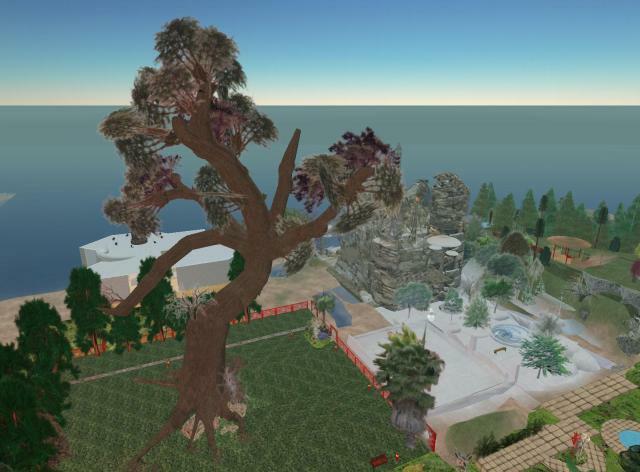 I heard about it, and became the second avvie to put down roots there, donating my Premium 512 (and another $5/month to make it 1024)… never realizing, until today, how precisely Fate had plunked me back down on the same piece of virtual ground. 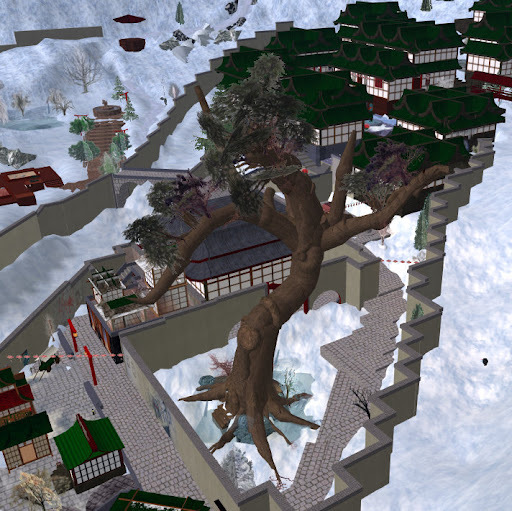 Neither Snakekiss nor her builds vanished from the face of the grid, however… she relocated and expanded, and (with some help) established a Japanese alpine village in the region of Orelle, and parts of Livigno and Ayas. It’s called Silk Waters Mountain. Same tree, five years later, half a continent away: built by Kelwyn Gallant (a Charter Member) in October 2004. The old Red Dragon Market is in Orelle now, too, as are some of the same rentals Snakekiss kept in Tehama. In spite of all the geologic and social upheavals and the frequent changes in ownership (and my personal reminiscences), there is a corner of Tehama that has remained completely unaltered since December 2002. Scroll back up to the map at the very top of this post for a minute, and look at the southwest corner. See that little winding creek that cuts across it? It bears no title, but I like to think of it as King Cnut trying to hold back the tide… of Time. 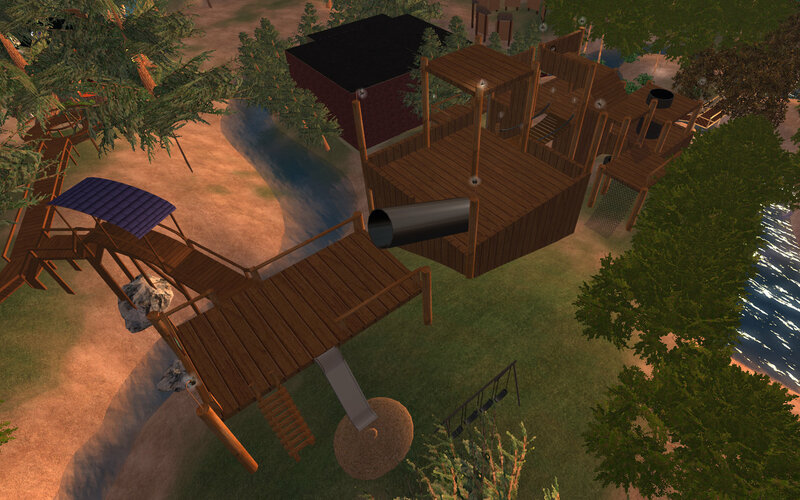 Perry was formerly home to, in 1.0 and 1.1, Devlin Gallant’s mansion, a “honey store” and a marina, as well as an old Linden-controlled educational event area. 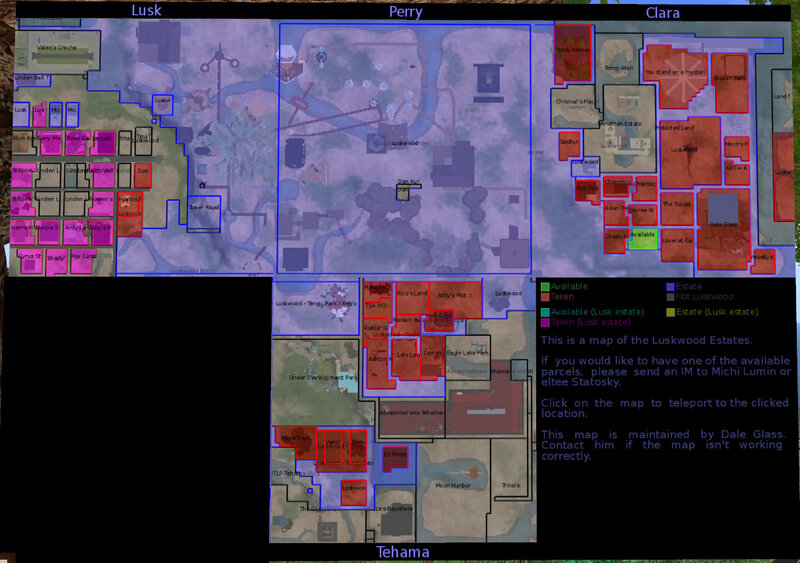 As of SL 1.4, and continuing into 1.7, most (about 95%) of Perry has been annexed to Luskwood, maintained by the Luskwood group and forming “Luskwood East”, used for events such as Zendo and the Artist Ambush. Together with Lusk, Luskwood’s size now exceeds 90 square kilometers [sic]. 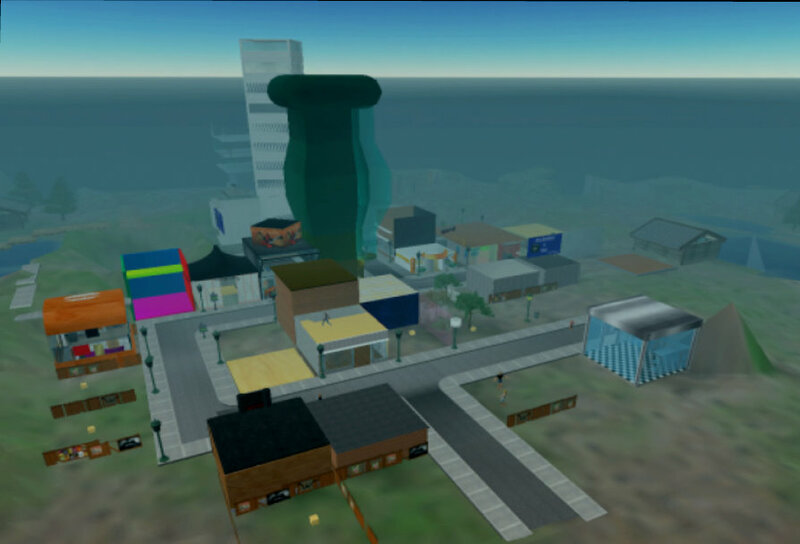 It is a peculiarity of the Wikia’s older entries to speak of periods of time in terms of which version of Second Life was current, rather than a calendar date; in fact, even their Timeline page (which only lists up to 1.10) rarely mentions release dates, for which you must click to the entry for that Release. Translating “1.0 and 1.1” yields June 23 (Opening Day) through December 21, 2003; “1.4” = June 15, 2004; “1.7” = October 21, 2005. 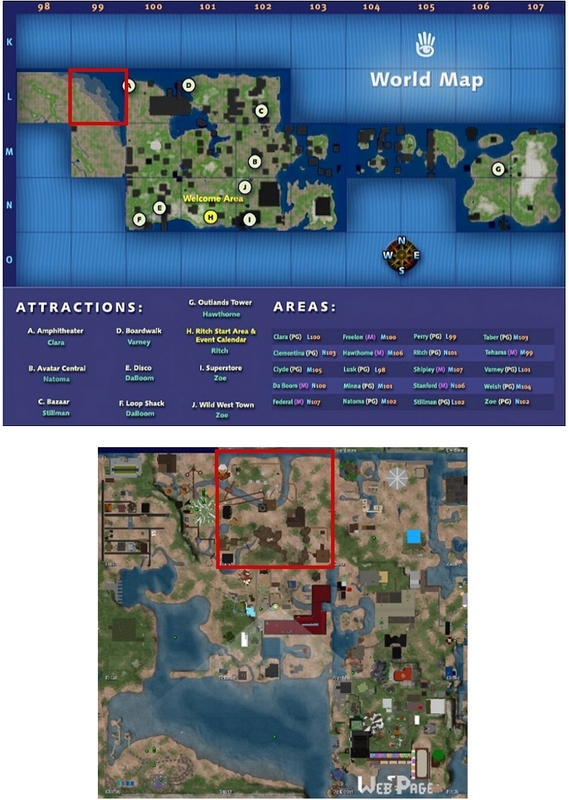 In any event, nothing remains in Perry from when it first appeared on the World Map while SL was still in closed beta — not even its original coastline, which might have supported a marina (I don’t want to speculate what was meant by “honey store”…) And, since Snapzilla didn’t come into existence until 2005, no verifiable older photos are available, either. 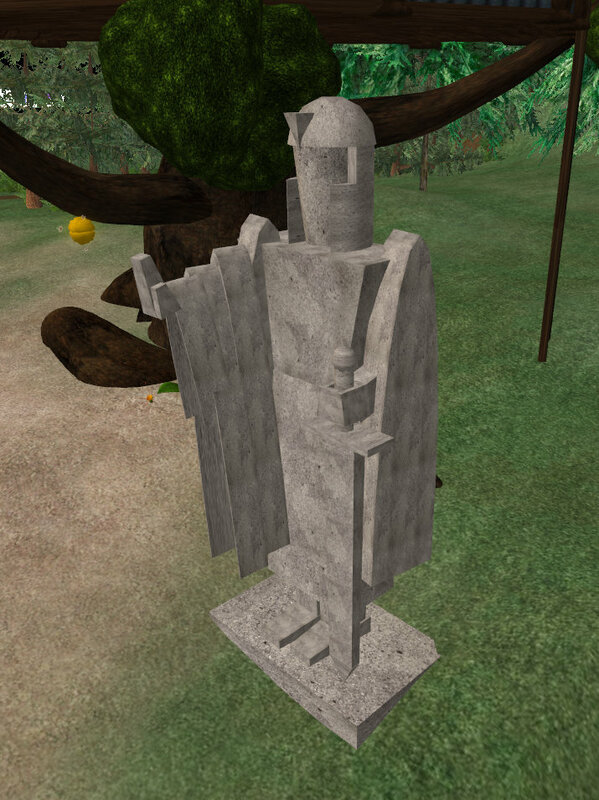 Rather, Perry has become a repository of early Luskwood artifacts, some still used, many not; while they should technically be outside the scope of this survey, as its author, I can stretch my own rules. 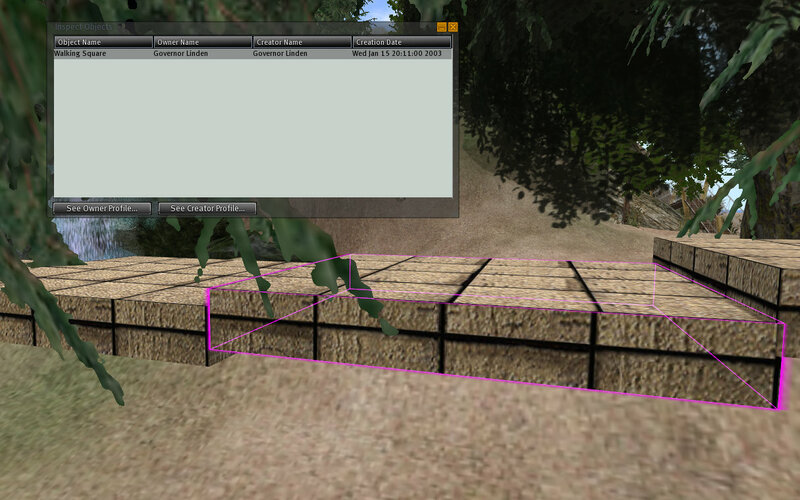 Another of Liam Roarke’s many contributions to the Luskwood infrastructure (June 2004). 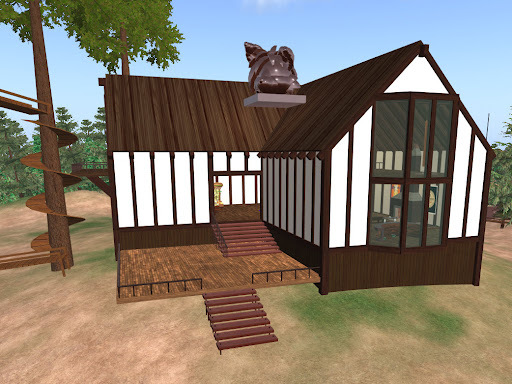 Beyond it lies the blockhouse which serves as the “server hub” for Luskwood Creatures Collective, the furry avatar consortium (IMHO, one of the best on the grid, as well as the longest in continuous existence). It was built by Michi Lumin in August 2004, and houses server racks and associated equipment by Arito Cotton, built at the same time. Oddly, the build in Perry most significant to Luskwood’s history has only been in Perry for less than six months: Pub Giant Eltee Head. Bearing a likeness of eltee Statoski (one of Luskwood’s four co-founders), created in March 2005 by Arito Cotton (another founder, along with Michi and Liam, see above and the Lusk entry of this blog), this Tudor-style venue replaced an earlier version, and was built in Lusk by eltee in May 2005. It remained there through the spring of this year, when it was relocated to Perry. There used to be a stable (for the equine furries, I suppose) up in the northeast corner – there’s a photo or two featuring it at Snapzilla. And, as always, there’s more in my online album.